Every autumn I get truckloads of leaves dumped at a holding area where they sit to let snow, rain, heat, and time reduce the volume and bring about decomposition to create an ideal mulch. I spread that mulch the following autumn. (Freshly fallen leaves are also a good mulch but tend to blow and are too fluffy for easy handling.) So, methinks, “That leaf pile just sits there from spring through autumn; why not plant sweet potatoes right into the pile in spring?” It was worth a try even though sweet potatoes don’t like soils having abundant fresh organic matter. The leaf pile was pure organic matter! I tried this on a small scale last year. Mice ate the potatoes which, anyway, were few because I got the plants in late and sweet potatoes are a long season crop. I did salvage cuttings from the vines, which root easily, and carried them over last winter on a window sill to make plants for this year. This year’s leaf pile was further from the stone wall that mice evidently call home, and potted plants went into compost-filled holes hollowed out into the pile. All summer the vines grew, and grew, and grew. Frost, anathema to sweet potatoes, is imminent so yesterday I decided it was time to start grubbing into the pile to look for sweet potatoes. I found a few small and medium-sized tubers, one of which had been gnawed by mice. Not very encouraging. Wandering past the pile a couple of hours later, I spied what looked like a large butternut squash starting to emerge from the pile. 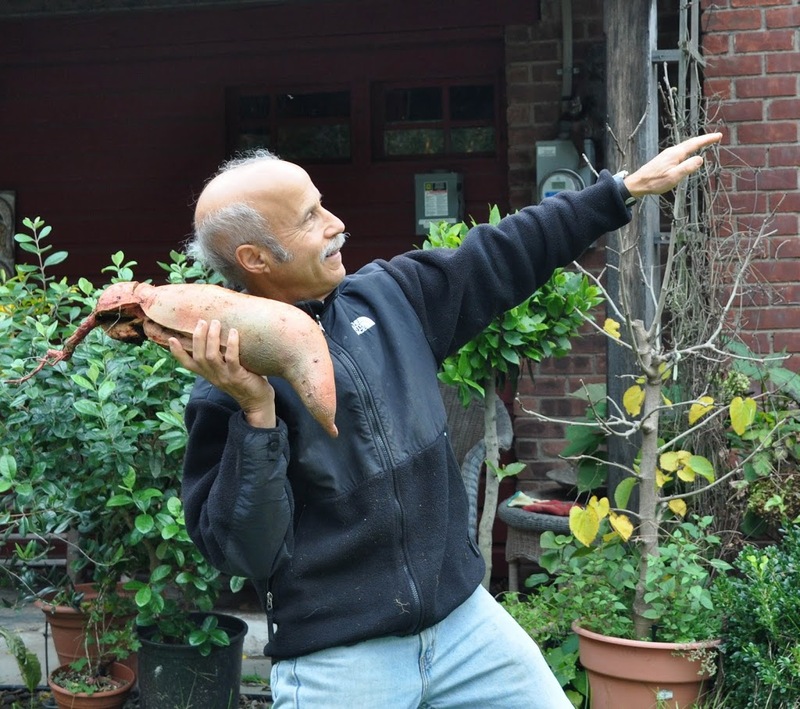 It was, in fact, a giant sweet potato tuber, a couple of feet long and a few inches across, that had formed where the vine had rooted as it sped along atop the leaf pile. Then I found another humongous tuber. And another, as well as some rationally sized ones. Success. I can’t wait to show them to Lance. 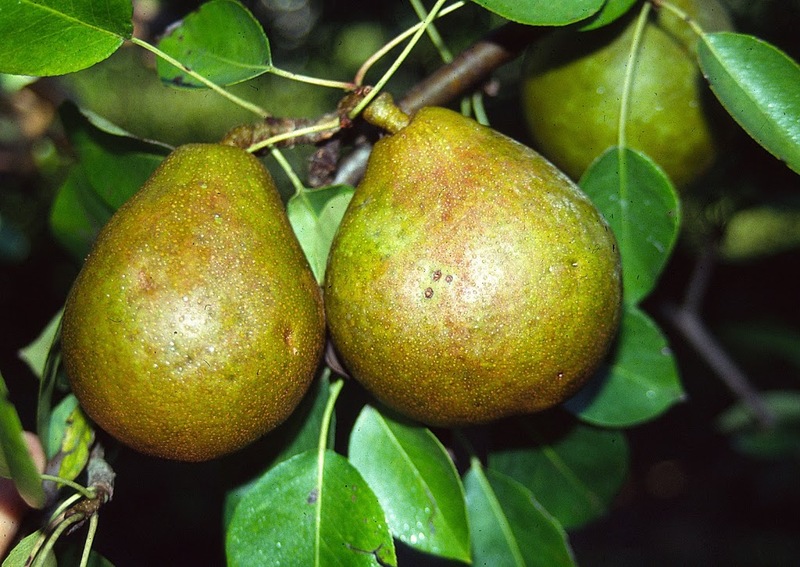 For a variety of known and unknown reasons, this year was good for pears. Not just here, but generally in the northeast, at least judging from reports from a number of people. Spring weather was ideal for pollination, with no late frosts once weather started to warm. I had a number of varieties in bloom so cross-pollination was good. And for some reason, despite alternating periods of rain and drought followed by too, too much rain, the crop developed and ripened nicely. Of all the pears I grow, the best-tasting is the variety ‘Magness’. It takes awhile to begin fruiting and then doesn’t yield well or consistently, or keep very well. But when ‘Magness’ is available, there’s hardly reason to eat any other pear. (Except for ‘Comice’, which is the pear usually grown in the Pacific northwest and packed into fancy fruit gift boxes; ‘Comice’ allegedly doesn’t grow well in the northeast. ‘Comice’ is one parent of ‘Magness’.) My two ‘Magness’ trees bore abundantly this year, I harvested the fruits just as the first pear dropped, kept them refrigerated for about a month, and now eat them after a day at room temperature. The flesh is juicy, sweet, and perfumed. Anyone planning to grow this excellent variety needs to provide for for cross-pollination. ‘Magness’ is pollen-sterile and can’t pollinate anything else so three different varieties are needed to be able to pick fruit from all three trees. What an honor it would be to have a plant named after you. I was fortunate, many years ago when I worked in the USDA Fruit Laboratory in Maryland, to meet Dr. Magness, for whom ‘Magness’ pear was named. He had retired as chief of the Fruit Laboratory. And there was the Canadian farmer, John McIntosh, who discovered the tree that became his namesake variety two hundred years ago. ‘Macoun’ apple was bred here in New York, a deliberate hybrid of ‘McIntosh’ and ‘Jersey Black’ that was named, in 1923, after Canadian fruit grower W. T. Macoun. And so on. How about having a weed as your namesake? I’d even take that, with reservations. One weed that comes to mind because it’s still spreading as if it was high summer is Asiatic dayflower. Actually, it’s quite an attractive plant, with arrow-shaped, succulent leaves that clasp the decumbent, fleshy stems. 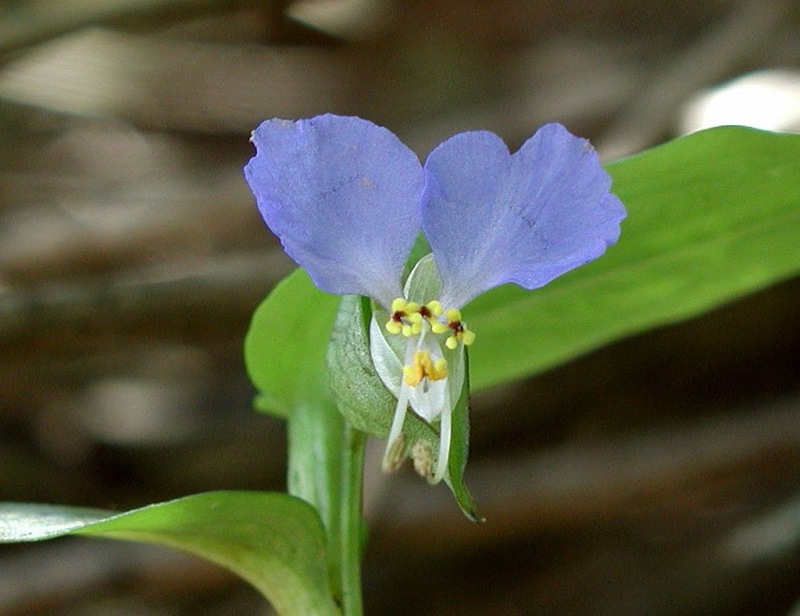 The genus, Commelina, is characterized by flowers with two prominent, sky blue petals that pay homage to two similarly prominent brothers, 18th century Dutch botanists Johann and Caspar Commelin. Look closely at the flowers, though, and you’ll see that in addition to the two prominent, blue petals, each flower also has an insignificant, minuscule, white petal. There was also a third brother. I am always searching online for articles that can help me. There is obviously a lot to know about this. I think you made some good points in Features also. Very helpful information, thank you!